Melt butter over medium heat. Add leeks; sauté 3 minutes. Add mussels and ouzo. Cover and simmer for 3-4 minutes. Using slotted spoon, transfer mussels to bowls. Discard any that don’t open. Stir cream and 2 T. parsley into liquid in pot. Simmer uncovered 3 minutes or until sauce thickens slightly and coats the back of a spoon. Check seasoning. Pour sauce over mussels. Sprinkle with remaining parsley. Serve with Italian bread or a baguette. 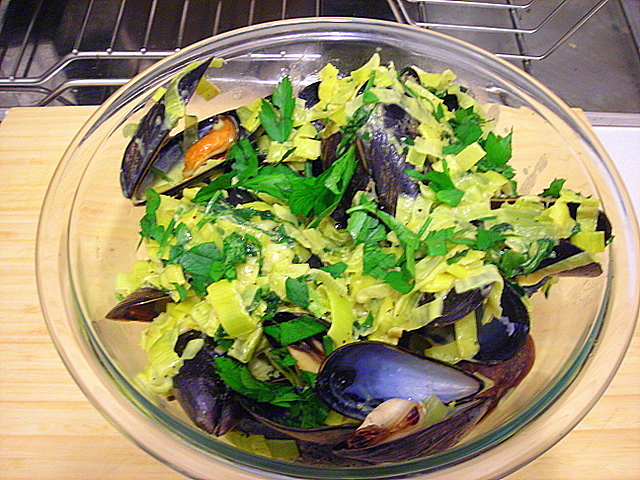 Note: If you substitute shallots for the leeks and Calvados for the ouzo, it will be moules à la normande. 13 Nov	This entry was published on November 13, 2007 at 1:40 am and is filed under food, general. Bookmark the permalink. Follow any comments here with the RSS feed for this post. This is a “problem”? I know you know that leftovers are often better than whatever gave rise to them. This dish looks and reads delicious. H — only a problem in that I was looking to do something with a ton of mussels that didn’t involve pasta or soup. Then I recalled that I had made this several months ago but it could use an update. Side note: I once dated a guy who detested leftovers; his premise was that food kept in the fridge past its prime was “a waste of space”. That fling lasted all of six weeks. He had er…other redeeming qualities. The ideal boyfriend will be someone who has close to zero food issues. I remain hopeful.